Worried about an increase in gas taxes or vehicle registration fees? Calm yourself. A poll last week by North Carolina-based Public Policy Polling showed only 27 percent of those surveyed had a positive opinion of the 85 Republicans who serve in the Michigan Legislature, with 56 percent holding a negative opinion. Not good. Democrats in the Legislature, who had net positive rating of three points (41-38), also best the GOP in the generic election question by 12 points. Among respondents over the age of 65 -- those more likely than most to vote next year -- it was a nine-point Dem advantage. Nothing dispels the notion that Republicans were going to unilaterally jam through Gov. Rick Snyder's $1.2 billion transportation tax increase more than numbers like that. And Democrats, as evidenced by last week's missed deadline to put a sales tax alternative for roads on the May 7 ballot, are certainly in no mood to cooperate. Not that the economic priorities of both sides couldn't be addressed if, by chance, the political imperatives of November 2014 could be set aside, just for a couple of months. One of the biggest obstacles to generating more revenue for roads and transit is an existing sales tax on gasoline sales that generates nearly $900 million for schools and local governments but very little, alas, for transportation. Motorists correctly perceive that they’re paying enough tax on fuel as it is and wonder why the roads aren’t better as a result. Removing gasoline from the sales tax base and replacing sales tax money with an equal level of gas tax hammers the K-12 budget, however, so the votes aren’t there for that. Assuming a two-thirds vote to put a penny rate increase on the statewide ballot can't be assembled -- especially for a special election costing $10 million -- the only other option is to rebuild the sales tax base by applying the tax to things that aren’t taxed now. Such as baby shoe bronzing. Michigan’s powerful baby shoe bronzing lobby gets a bad rap for souring the public on the Legislature’s last foray into taxing services during the 2007 budget meltdown. It wasn’t that the bipartisan sales tax expansion that expired after a few weeks of ridicule was a bad idea. It was just very badly executed. There was no explanation as to why bronzing was taxed and Detroit Lions season tickets were not. Even so, Michigan's $31 billion list of tax expenditures, carve-outs and loopholes is becoming the go-to source for financing the reconstruction of Michigan's economy. Snyder came into office with a platform to make Michigan’s business tax code more competitive. He financed the replacement of the Michigan Business Tax through a broadening of the income tax base, which included narrowing or eliminating income tax expenditures, particularly for retirement income. Money to pay for last December’s reduction in industrial and commercial personal property taxes will eventually come (2014 voters willing) from the general fund budget as use taxes are diverted to cover expected revenue losses to local government and education. The assumption is that the general fund will be replenished as Granholm-era alternative energy tax credits -- another form of tax expenditure -- expire. Revisiting the sales tax on services section of the tax expenditure code would solve the financial puzzle of securing more funding for roads and the political challenge of legislative passage. Expanding the base -- as opposed to raising the sales tax rate -- takes just a simple majority of the House and Senate. The largest single tax expenditure on the books is the $10.7 billion sales tax exemption on services. Republicans seeking an alternative to both a gas tax increase and a sales tax rate increase know this fact. So do Democrats, whose votes would be needed for a sales tax overhaul and have investment ideas of their own. Last week, Senate Democrats introduced a package of bills to pretty much fund community college and university tuition for qualifying Michigan students. They also targeted the tax expenditure budget as their revenue source. The 2007 service tax that was replaced by a far worse business tax surcharge, would have raised an estimated $750 million on a full-year basis, without touching much in the way of sports and entertainment services. According to the Treasury Department’s latest tax expenditure report, eliminating the exemption on tickets would generate $220 million. Combine the two and that's nearly $1 billion – but still only 10 percent of the total tax exemption list, which is growing every year. The argument for replacing the per-gallon application of the gas tax -- its base is shrinking as consumer preferences change -- can be made about the sales tax. In the past two decades, sales tax collections have fallen from 2.2 percent of Michigan personal income to about 1.8 percent as more is spent each year on services and less on taxable goods. While the public would obviously prefer tax-free movie tickets, oil changes, lawn treatment and car repair, the benefit of taxing those things -- as opposed to hiking the rate -- spreads the burden among individuals and business. Would it affect consumer behavior? On Stub Hub last week, the starting price for a right field grandstand ticket for the Tigers' Opening Day game against the Yankees was $205.50, nearly 10 times the face price. Will fans who pay 6-percent sales tax on an $8 cup of beer balk at paying sales tax on their tickets? Had Democrats not thrown away their House majority in 2010, Snyder likely would have had to make a deal on a broad tax reform package to pay for both the tax cut demands of GOP business constituencies and the spending desires of the groups that back Democrats. Sort of like the deal that Democrats should be insisting on right now. Investing in the college careers of Michigan's young adults is just as important to Michigan's competitiveness as the size of its business tax burden or the condition of its roads. Though Democrats don't control the gavel, when it comes to transportation funding, Democratic votes are no less relevant. And if Snyder's going to get his road funding, a deal is going to have to made to get them. But to land a deal you first have to pursue one. I'm encouraged. An extension of the sales tax to some services sounds like a politically feasible way of raising the necessary funds. But I strongly disagree with Mr. Luke's belief that funding college tuition for every high school graduate would contribute as much to improving the economy as investing in infrastructure. On the other hand, helping graduates get training in a vocational skill would be a good idea. Strongly support governor's proposal but more importantly, support a significant carbon tax as advocated by Friedman in NYT today. We should pay more and use taxes to both discourage carbon consumption and fund social needs. The NYT and the democratic establishment is nuts to justify calls for more taxes on the "rich". 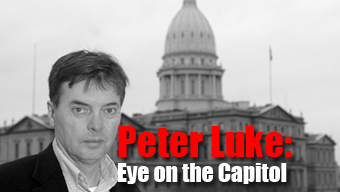 there are ways to get there but not based on ideology..
Amazing that Luke can't bring himself to cite the numbers coming out of last fall's election: That, state-wide, Democratic party candidates out-polled Republican candidates by a margin of roughly 55 per cent to 45 per cent. Yes, in the Michigan House of Representatives, at least, Republicans are the minority party.